Flowering plants and pollinators have a unique relationship—they need each other to facilitate mating and pass on their genes. From the plant’s perspective, it is imperative for them to attract pollinators; no pollinator visits mean no reproduction. Attracting pollinators can be difficult and some plants have by-passed this difficulty by evolving self-compatibility, meaning they can self-fertilize. However, the mixing of genes that occurs during sexual reproduction is still more evolutionarily beneficial. As a result, most flowering species reproduce by outcrossing, the mixing of genes with genetically different individuals. Therefore, flowering plants attract pollinators and reward them for their services. Plants advertise themselves by being colorful and emitting scents that entice bees and other insects to visit, and they produce nectar and pollen to reward them. Fig. 1 Orchids have mastered the art of pollinator deception, creating a multitude of beautiful flower forms in the process. Image via Wikimedia Commons. The key to pollination is the reward. Whether it is energy-rich nectar, protein-rich pollen, or mate-attracting scents, if pollinators are not rewarded, their work is for nothing and they will avoid flowers without rewards. Plants are therefore selected to be “honest” partners. Although it seems like most flowering plants are “honest,” offering rewards to pollinators, there are a quite a few cheaters. Just like some visitors avoid carrying pollen when stealing nectar, some plants do something analogous, they trick pollinators into thinking they are offering a reward. These kinds of plant-pollinator partnerships are sometimes called specialized deceptive pollination systems. Orchids are the masters of such deceptive methods. There are approximately 28,000 different species in the orchid family (Orchidaceae) . Not only is the orchid family species-diverse, its pollination mechanisms are also incredibly diverse, drawing attention since the days of Charles Darwin . From self-fertilization to outcrossing, orchids do it all but they are especially good at employing deception to attract pollinators. It is estimated that about one third of orchids “cheat” their pollination partners . The most common form of orchid deception is fooling a pollinator into thinking there is a reward waiting in the flower . Most orchids that use this strategy take advantage of naïve pollinators that have newly emerged and are probing for resources. Orchids use the same kinds of signals used by honest flowers. They have showy displays and scents, with the exception that they do not actually offer pollen or nectar. Some orchids do however produce pseudopollen or fake anthers, like Arethusa bulbosa  [Fig 2]. Without a doubt, the most interesting form of food-foraging deception is Batesian floral mimicry. Certain orchids actually mimic displays or scents from flowers that coexist with them; usually the mimicked flower offers a reward while the mimicking orchid does not [Fig 3]. This makes picking rewarding flowers from non-rewarding ones difficult and provides a perfect opportunity for the orchids to be pollinated without investing resources in nectar. Fig. 3 Look! We are just like you! Two orchid species (right and left frames) mimic a co-occurring Stigmaphyllon sp (center frame). flower. Image via Wikimedia Commons. Perhaps the most bizarre, yet elegant of the deceptive strategies used by orchids is sexual deception. Deceiving pollinators to search for rewards that don’t exist is one thing but making them think they have found a mate is a completely different ordeal. 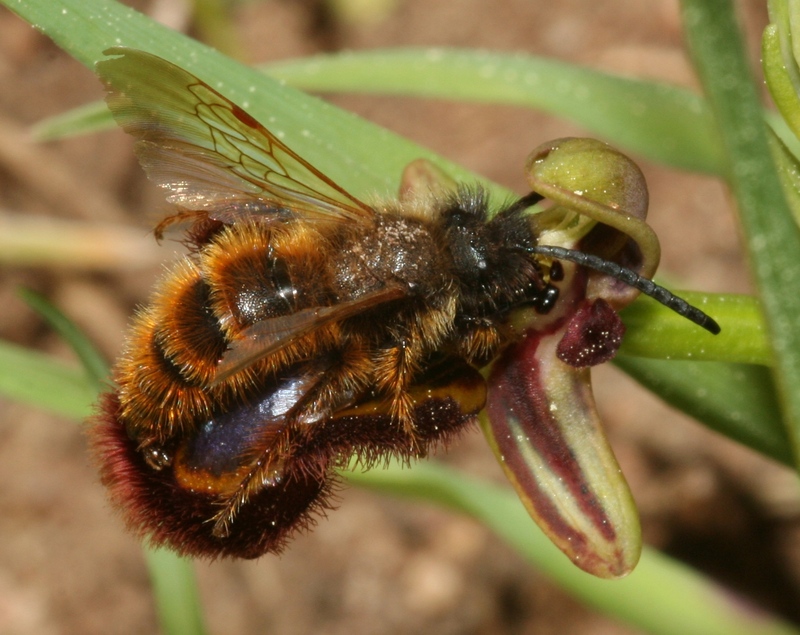 Yes, some orchids actually fool male pollinators into attempting to copulate with their flowers [4, 6]; this phenomenon is called pseudocopulation. Orchids that do this are very specialized, targeting a specific pollinator species. Sexually deceptive flowers often emit scents like those produced by the female of the pollinating species, making their deception convincing enough to fool the pollinator into landing on a flower and picking up pollen while attempting to copulate. Species like Ophrys speculum not only look like a Dasyscolia ciliate female, they also smell like them. Fig. 4 Male wasp copulating with what he thinks is a female wasp. Ophrys speculum, like other orchids, is pollinated by pseudocopulation. Image via Wikimedia Commons. Pollination is not as straightforward as it seems. Even though they need each other to reproduce, pollinators and plants find ways to spend as little resources as possible when interacting with one another. There are no plants that are as good as orchids at getting the most bang for their bucks, some of them get a lot of bang for no bucks. Willmer, Pat. Pollination and Floral Ecology. Princeton University Press, 2011. Christenhusz, Maarten J.M., and James W. Byng. Phytotaxa, 261(3), 201-217. 2016. Ackerman, James D. Lindleyana, 1(2), 108-113. 1986. Jersáková, Jana, Steven D. Johnson and Pavel Kindlmann. Biological Reviews, 81(2), 219-235. 2006. Scopece, Giovanni, et al. The American Naturalist, 175(1), 98-105. 2010. « Seeing is Believing - How Can We Visualize Tiny Colorless Bacteria?